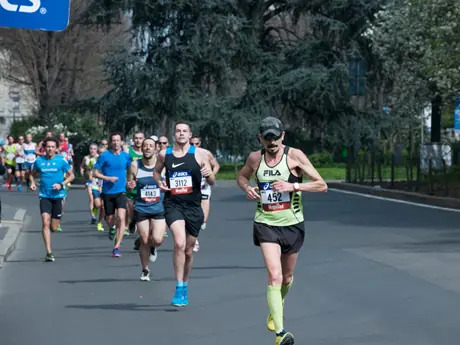 Many big marathons—and increasingly, smaller ones as well—offer the opportunity to run with pacers—volunteers who are willing to run slower than their normal pace, hold a sign or a wooden dowel with balloons tied to it, and get to the finish exactly at the advertised goal time. Should you join them? Pacers can give you that extra push you need, keep you on the right pace or even provide a distraction from the pain you're feeling. Even the most experienced marathoners can get caught up in the excitement. After all that training, and then the agony of the taper, by the time you get to the start line, your body is straining against the reins of your mind. Those first few miles feel so good—even though they're 45 seconds faster than your goal pace. Your mind, that big fat liar, will try to convince you that you can hold it. Staying behind a pacer for the early miles may keep you from blowing up later. Big races pay pacesetters (called rabbits) to take the lead for the first part of a race. As coach Bill Bowerman told his star runner Steve Prefontaine in the movie Without Limits, "It takes eight percent more energy to lead than to follow. Front-runners cut the wind for everybody behind them and then die in the stretch. In a close race, a front-runner never wins." Having a pacer is not cheating; it's smart racing. The military knows this. Herd animals know this. It's safer to stick together than to go it alone. Do you really want to be the lonely gazelle that gets picked off by the lion waiting in the bush? There's energy and strength in numbers. Plenty of people hit all their training goals and still fail to finish a marathon in their target time. Staying focused for 26.2 miles requires mental toughness. Your headspace can be a bad neighborhood. Why not leave the hard work of thinking to someone else? Rachel Toor teaches creative writing at Eastern Washington University in Spokane and is the author of four books, most recently a young adult novel, On the Road to Find Out. She's run more than 60 marathons and ultras, many of them as a pace group leader.